Current version: 2.1. Please do not use older versions. 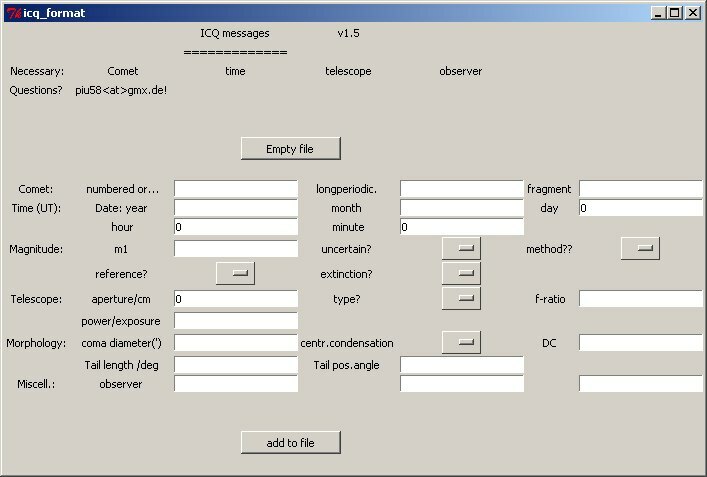 To lighten the task of submitting observation we wrote the software ICQ_format.exe. Please download this file and store it in a directory. Beside this there is no further installtion necessary. The program writes the file "ICQ.txt" which resides in the same directory like the program. You can also use the desktop for this. For a new set of observation press "Empty file". Old observations will be cleared, you get an empty field with a heading. Numbered comets are typed in the first field, the second remains empty. Not numbered comets are given in the second field, the first remains empty. Comet destinations are given startin with the year of detection and without spaces in the name. Periodic comets at their first apparition are preceded by the letter P. Correct names are 2007N3, 2006OF2 and P2001Q6. Times are given up to minutes. The software calculates the fractures of the day by itself. Please use Universal Time. Please do not use leading zeroes in dates: Don't use 03 for March, but simply 3. You can only use units given by the program: coma diameter in arc seconds, tail length in degrees. Please use decimals to give a small diameter or length. Run time errors can be closed by ok. After this you can correct your input. You may get empty or incomplete lines in "ICQ.txt" which need to be removed manually. It is possible to close the program and add later more lines. At March 1st, 2009 , 1830 UT I observed the comet C/2007 N3 (Lulin) with my 10x30 pairs of binoculars. I measured the brightness to 5m7 using the Tygho-2-cat. Die coma diameter was determined to 26 arc minutes, the tail was 1.3 degrees long with a position angle of 220°. The comet war rather strongly condensed with a not dominating stellar central condensation. If you have problems with the usage of the program please consult the the german page. It contains a step-by-step explanation whose images you may be able to decifer. You may write me an email if you need more support.